The aim of this project is to provide an integrated approach for the practical application of performance-based fire engineering design of composite structures including joint performance, under natural fire conditions including the cooling phase. By developing methodologies to evaluate the full 3D behaviour of joints between composite floor systems and composite columns, including an assessment of their ductility limits, and incorporating the joint models into global frame analysis, innovative solutions can be achieved which ensure cost-effective design against fire attack and a realistic estimation of real safety levels, and which avoid premature collapse of a composite structure in fire. The project partners are: DESMO, a. s., Luleå University of Technology, Tata Steel Europe, The University of Manchester, The University of Sheffield a Universidade de Coimbra in cooperation with MV-GŘ HZS ČR, PAVUS, a. s., TÚPO and ÚTAM AV ČR, v. v. i. To the erection of experimental building contributed: ARCHaPLAN, s. r. o., ArcelorMittal Construction CZ, s. r. o., Hilti ČR, spol. s r. o., Kovové profily, spol. s r. o., Metrostav, a. s., Morávek CZ, s. r. o., Promat, s. r. o., HARSCO Infrastructure CZ, s. r. o., ROCKWOOL, a. s. a SKÁLA & VÍT, s. r. o. Media partner journal KONSTRUKCE. 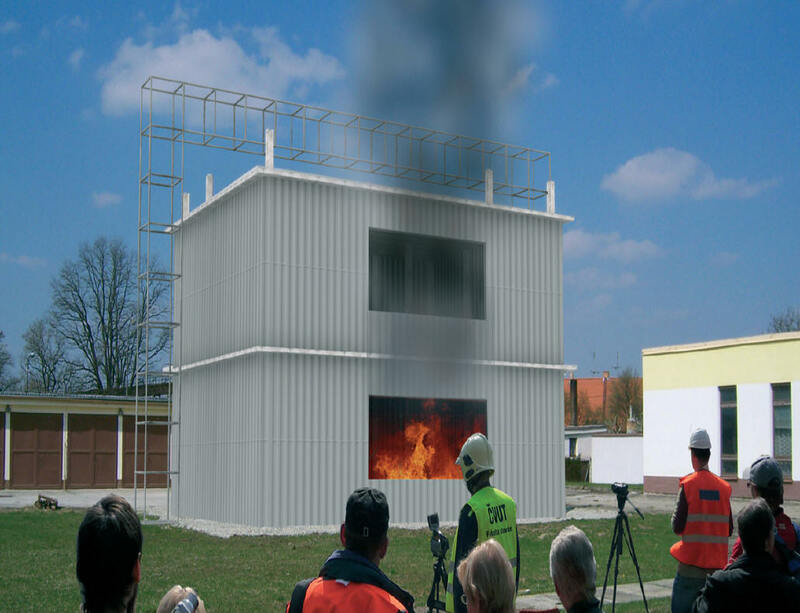 A fire test on two floors of administrative building 10,4 m x 13,4 with height 9 m was performed in PAVUS laboratory in Veselí n.L. on 6 and 15 Sept. 2011.